Introduction: LPG is the most widely used cooking fuel in India and in the world. It should be safely contained in gas cylinders and used safely only when necessary. Any misuse of the gas, particularly by children, could result in death or injury. Parents with young children (children below the age of 10) at home would want to secure their gas cylinders against their children’s mischievous activities. About Lukko Safety: Lukko Safety was founded in April, 2018 in Gurgaon, Haryana. 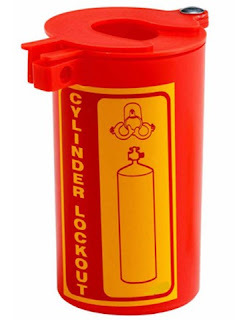 The company manufactures various types of locks like Cylinder Lockout Tagout LS-PL89 and Cylinder Tank Lockout Tagout LS-PL88 to lock the knob of gas cylinders and prevent misuse by children. The company follows ISO 9001:2015 lock quality standards and its locks are CE certified. The company has been selling its knob locks for more than ten years now and not a single complaint regarding the quality of their knob locks has been received. They also have a dedicated call center to address complaints regarding quality of their products or dangerous gas leaks. Lockout Tagout HASPS: If you are super safety conscious and you feel that a single lock for your cylinder knob is not enough. 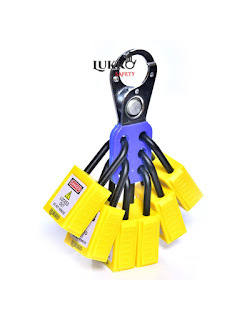 Lukko Safety also sells Lockout Tagout HASPS where you can lock your cylinder with one lock and lock the plates of the lock with a number of locks! This way there is no way that children can misuse the gas but be warned! You have to remember the keys correctly for the locks that lock your knob lock. Any misplacement of the keys or mismatch of the keys could spell disaster! Lockout Tagout HASPS come with ball valve lockout tagout locking mechanism. Conclusion: There have been numerous reports in India where mismanagement of LPG has led to deaths or severe burns. Children especially, are intrigued by LPG cylinders and fiddle with them resulting in cylinder explosions and deaths due to fire. So kindly lock your cylinders with Lukko Safety knob locks when not in use and do not allow young children inside the kitchen when unlocking and using LPG cylinders. LPG cylinders should be used safely and only when needed. Lockout tagout, also known as LOTO is a safety procedure used in industry and research settings to make sure that hazardous machines are shut off appropriately and not able to be started up again before the completion of repair work or maintenance. Lockout-tagout is utilized across industries as a secure method of working on dangerous equipment and is mandated by law in some countries. About LUKKO SAFETY IMPEX PVT. LTD. This is one of the most reliable Supplier/Manufacturer/Exporter of standard – Industrial Safety Products and Lockout tagout with LOTO methodology guidance, applicable in numerous industries to stop hazardous conditions/accidents/acts occur because of human fault or technical causes at the place of work by offering awareness.